The U.S. Census Bureau and the U.S. Bureau of Economic Analysis announced today that the goods and services deficit was $54.0 billion in September, up $0.7 billion from $53.3 billion in August, revised. Source: U.S. Census Bureau, U.S. Bureau of Economic Analysis; U.S. International Trade in Goods and Services, November 2, 2018. September exports were $212.6 billion, $3.1 billion more than August exports. September imports were $266.6 billion, $3.8 billion more than August imports. 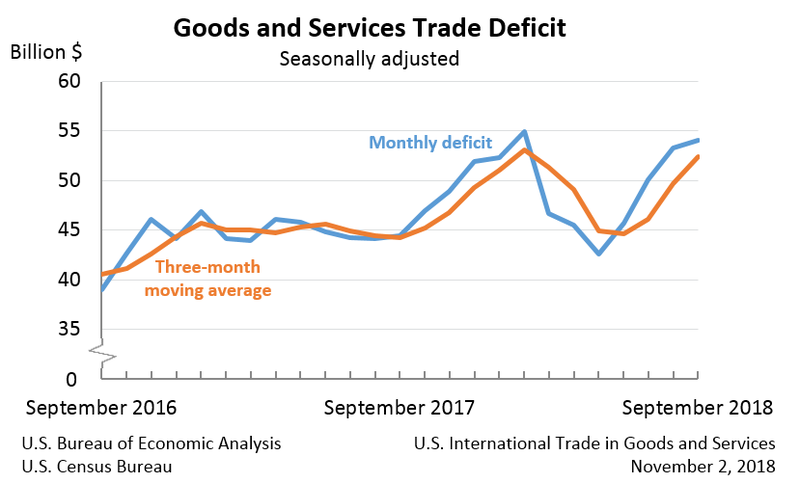 The September increase in the goods and services deficit reflected an increase in the goods deficit of $0.6 billion to $77.2 billion and a decrease in the services surplus of $0.1 billion to $23.2 billion. Year-to-date, the goods and services deficit increased $40.7 billion, or 10.1 percent, from the same period in 2017. Exports increased $143.8 billion or 8.2 percent. Imports increased $184.5 billion or 8.6 percent. The average goods and services deficit increased $2.8 billion to $52.5 billion for the three months ending in September. Average exports decreased $0.2 billion to $211.0 billion in September. Average imports increased $2.5 billion to $263.5 billion in September. Year-over-year, the average goods and services deficit increased $8.2 billion from the three months ending in September 2017. Average exports increased $14.7 billion from September 2017. Average imports increased $22.9 billion from September 2017. Exports of goods increased $2.9 billion to $141.9 billion in September. Exports of goods on a Census basis increased $2.8 billion. Industrial supplies and materials increased $2.8 billion. Other petroleum products increased $1.1 billion. Nonmonetary gold increased $1.0 billion. Capital goods increased $1.1 billion. Civilian aircraft increased $1.2 billion. Foods, feeds, and beverages decreased $1.0 billion. Exports of services increased $0.3 billion to $70.7 billion in September. Imports of goods increased $3.5 billion to $219.1 billion in September. Imports of goods on a Census basis increased $3.7 billion. Capital goods increased $2.4 billion. Telecommunications equipment increased $0.5 billion. Civilian aircraft engines increased $0.5 billion. Computer accessories increased $0.4 billion. Other textile apparel and household goods increased $0.5 billion. Toys, games, and sporting goods increased $0.4 billion. Cell phones and other household goods increased $0.3 billion. Automotive vehicles, parts, and engines decreased $0.6 billion. Trucks, buses, and special purpose vehicles decreased $0.6 billion. Net balance of payments adjustments decreased $0.2 billion. Imports of services increased $0.4 billion to $47.5 billion in September. The real goods deficit increased $0.8 billion to $87.0 billion in September. Real exports of goods increased $3.1 billion to $151.0 billion. Real imports of goods increased $3.9 billion to $238.1 billion. Exports of services were revised down $0.1 billion. Imports of services were revised up $0.1 billion. The September figures show surpluses, in billions of dollars, with South and Central America ($3.2), Hong Kong ($2.4), Brazil ($0.6), and Singapore ($0.1). Deficits were recorded, in billions of dollars, with China ($37.4), European Union ($14.2), Mexico ($7.6), Germany ($5.2), Japan ($4.9), Italy ($2.3), OPEC ($2.3), Canada ($2.2), South Korea ($2.0), India ($1.7), Saudi Arabia ($1.5), France ($1.5), Taiwan ($0.9), and United Kingdom ($0.2). The deficit with China increased $3.0 billion to $37.4 billion in September. Exports increased $0.4 billion to $10.2 billion and imports increased $3.5 billion to $47.7 billion. The deficit with members of OPEC increased $1.3 billion to $2.3 billion in September. Exports decreased $0.6 billion to $4.6 billion and imports increased $0.8 billion to $6.9 billion. The deficit with Mexico decreased $1.1 billion to $7.6 billion in September. Exports increased $1.1 billion to $22.5 billion and imports decreased less than $0.1 billion to $30.1 billion. All statistics referenced are seasonally adjusted; statistics are on a balance of payments basis unless otherwise specified. Additional statistics, including not seasonally adjusted statistics and details for goods on a Census basis, are available in Exhibits 1-20b of this release. For information on data sources, definitions, and revision procedures, see the explanatory notes in this release. The full release can be found at www.census.gov/foreign-trade/Press-Release/current_press_release/index.html or www.bea.gov/data/intl-trade-investment/international-trade-goods-and-services. The full schedule is available in the Census Bureau’s Economic Briefing Room at www.census.gov/economic-indicators/ or on BEA’s Web site at www.bea.gov/news/schedule.